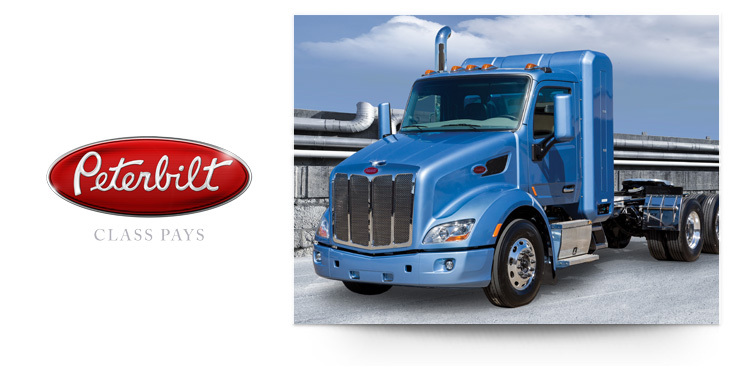 LONG BEACH, Calif. – May 4, 2018 – Peterbilt’s commitment to alternative energy solutions is showcased at the Advanced Clean Transportation (ACT) Expo. An all-electric Model 579 day cab tractor is on display in the Peterbilt booth #737. The drayage application tractor that will go into service at the Port of Long Beach after the show is one of twelve tractors built by Peterbilt in collaboration with Transpower, the California Air Resources Board, and the Port of Long Beach. The all electric Model 579 produces up to 490 horsepower, has up to a 200 mile range, recharges in less than five hours and has a battery storage capacity of 350-440 Kwh. “These demonstrator vehicles will be used to test the performance of an all-electric powertrain in a real-world environment,” said Scott Newhouse, Chief Engineer, Peterbilt Motors Company. Funding for the tractors was provided, in part, by the California Climate Investments (CCI), the state’s climate change-fighting, cap-and-trade program. The award is part of California Climate Investments, a statewide program that puts billions of cap-and-trade dollars to work reducing greenhouse gas emissions, strengthening the economy and improving public health and the environment. The cap-and-trade program also creates a financial incentive for industries to invest in clean technologies and develop innovative ways to reduce pollution.